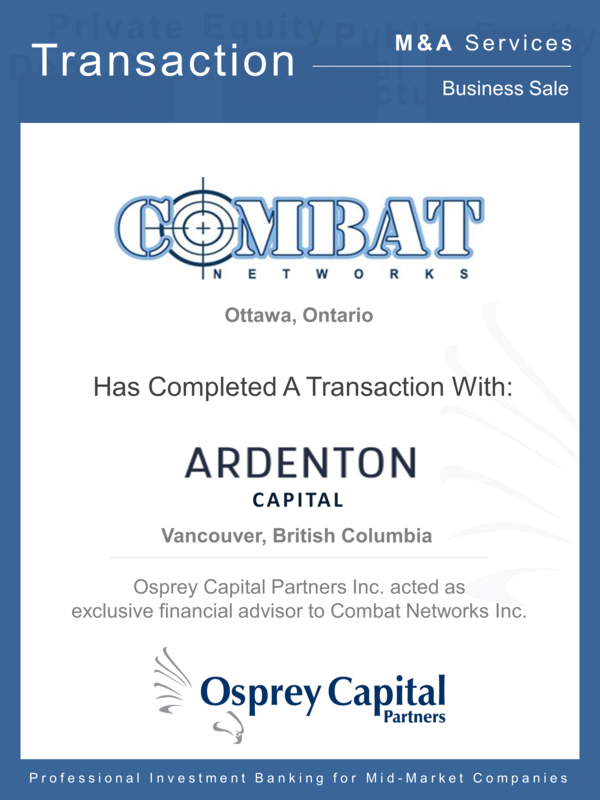 Osprey Capital Partners Inc. is pleased to announce that it has facilitated the successful transaction and partnership between Combat Networks Inc. and Ardenton Capital Corporation in which Ardenton Capital acquired a significant equity interest in Combat Networks. Combat Networks is a Canadian owned and operated network solutions integrator offering unified communications for enterprise, institutional, government and defense infrastructures. The Company provides data and voice communication network design, installation, product sales, support and maintenance services to customers who operate mission critical communication networks where security, performance and reliability are key. Founded in 2001 and operating from its locations in Ontario, Quebec and Alberta, the Company currently serves over 200 active customers in Canada and has an established stable of sub-contractor relationships to augment its national service platform. Combat Networks engaged Osprey Capital to find a partner that could bring additional resources, experience and expertise to enable them to further establish Combat’s leadership position and realize the Company’s growth trajectory. In seeking the right partner, Combat wanted to ensure stability and dedication to its employees and customers, while enabling it to capitalize on unique opportunities within the marketplace. 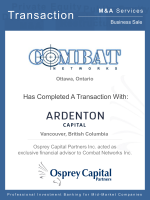 Osprey Capital Partners assisted and advised Combat Networks in sourcing their new partner, Ardenton Capital. Osprey Capital Partners assisted Combat in the negotiations and closing of the transaction and worked closely with Combat’s legal advisors, Norton Rose LLP.